Anthropologist Colin Turnbull was born London in 1924, and raised in a surreal upper class family, which he described in his important book, The Human Cycle. World War Two jolted the pampered lad into the bloody real world. In the 1950s, he spent lots of time in the Congo, with the Mbuti Pygmies, who inspired his masterpiece, The Forest People. It was a beautiful life-changing experience to live with healthy, happy humans who were profoundly in love with their sacred forest — nothing like the zombies of England. When war in the Congo zapped his plans for another visit, he accepted an assignment to learn about the Ik tribe in northeastern Uganda. The government wanted a plan for transforming them into law-abiding taxpaying farmers. For unknown thousands of years, they had been hunter-gatherers in the Kidepo Valley, an arid mountainous savannah. In 1962, their traditional lands became a 540 square mile (1,399 sq km) wildlife preserve, the Kidepo Valley National Park. Hunting was banned, and the Ik were moved into the mountains. They were expected to magically shape shift into farmers in a region that experienced droughts about one in every four years. Turnbull’s study ran from 1965 to 1967, and the first two years were back-to-back droughts. Crops withered in the fields, the granaries were empty, and about 2,000 people began to starve. Turnbull described the cultural meltdown in The Mountain People. Turnbull wrote, “The hunter and gatherer gives little thought for the morrow, getting his feed fresh, from day to day, with the ready assurance of someone who has come to terms with the world around him. He knows the world he lives in as few others do, and he lives in sympathy with it, rather than trying to dominate it.” A farmer can lose a year’s work in one night. A hunter can only lose a day’s work. When he first got there, the famine was just beginning. Two months later, the horror began. People became totally self-centered. Their two interests in life were now food and water. Most became habitual liars, and most took every opportunity steal Turnbull’s stuff. They pulled many juvenile pranks on him, hoping for him to get hurt or die. “The people were as unfriendly, uncharitable, inhospitable, and generally mean as any people can be.” They laughed hard at anyone’s misfortunes. It was amusing to steal food from the feeble, and push them down. Upon being weaned at age three, youngsters were thrown out of their parents’ house. Evicted children formed bands and wandered the countryside looking for something to eat. Lucky ones found some figs, the unlucky ate dirt and pebbles, and soon died. Feeding children and elders, who couldn’t take care of themselves, was a foolish waste of precious nutrients. Turnbull was often scolded for his idiotic generosity. He was feeding folks who were soon to be dead, cruelly prolonging their misery. Adults refused to feed their starving parents, or let them into their house. When they died, most were quickly buried in the family compound, in secrecy. If the villagers found out, they would expect a funeral ceremony, which required a feast. Famines were a crappy time to be born. Nobody was happy to see you, nobody cared. When out foraging, mothers put their babies down roughly, and didn’t watch them carefully. Maybe a hungry leopard would relieve her of her little bummer. One time, a leopard ate a baby. Sleepy from a delicious meal, the cat laid down for nice nap. Men found it, killed it, and ate it, baby and all. Turnbull once took pity on an old woman who was close to death. He wanted to create a new village, where the abandoned people could be properly cared for. She was not interested. She wanted to die near her son, who would not take care of her. Turnbull fed her, and gave her some food. She burst into tears, because this triggered memories of “a time when people had helped each other, when people had been kind and good.” She was the last survivor who remembered the good old days. Stuff like this fills most of the book. Turnbull spent 18 months eating by himself in his Range Rover. For some reason, he got the blues. He hoped “that we who have been civilized into such empty beliefs as the essential beauty and goodness of humanity may discover ourselves before it is too late.” “Most of us are unlikely to admit readily that we can sink as low as the Ik, but many of us do, and with far less cause.” Whoa! 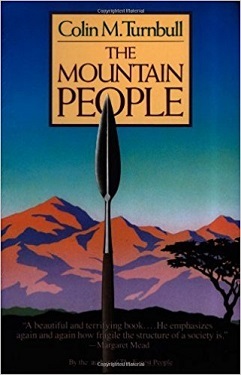 I first read The Mountain People in 2001, and it snapped my mind. It was an unforgettable book that you wished you could forget. I was blindsided by the misery, cruelty, and horror, and this was the impression that I took away from the book. In 2017, I read the book a second time, and it blew me away again, for another reason. Near the end of the book, Turnbull shared some troubling conclusions that I was too dazed to grasp in my first reading. He held up a mirror, so his well-fed readers could see their own deformities, and get their noses rubbed in them. Having spent years with the Mbuti, he had directly experienced a healthy functional society. Before that, he had grown to adulthood in twentieth century Western society, a world of atomic bombs, concentration camps, and the brutal extermination of tens of millions. It was the opposite of a functional society. It had become pathologically individualized and de-socialized — similar to the Ik, and in many ways worse. The Ik give us a taste of our days to come. 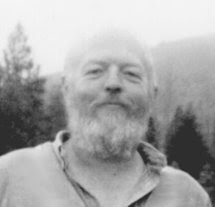 “We pursue those trivial, idiotic technological encumbrances and imagine them to be the luxuries that make life worth living, and all the time we are losing our potential for social rather than individual survival, for hating as well as loving, losing perhaps our last chance to enjoy life with all the passion that is our nature and being.” Today, Americans speed down the highways in their motorized wheelchairs while the polar ice melts, and monster hurricanes obliterate societies. Sorry kids! Here is a comment, from 45 years ago, that could have been written today. “The state itself, is resting ever more on both intellectual and physical violence to assert itself.” Heads of state and their assistants fill the air with “loud-mouthed anti-intellectual blabberings.” The populace learns not to believe, trust, love, hope, or think. The Ik were excessively individualistic, spending their days in solitude and boredom, rarely forming significant relationships. Each one was alone, and content to be alone. Turnbull often sat with Ik men on a ridge overlooking the valley, gazing into space. Day after day, all day long, not a word was ever spoken. This reminds me of the spooky smart phone cult in my town today. People gather around tables in a café, each silently gazing at their glowing screens. When it was released in 1972, The Mountain People got a lot of attention. Immediately, hordes of dignified scholars explosively soiled their britches. Heresy! The Ik were nothing but an extreme exception, a bizarre mutation! Civilized humans are moral and virtuous! We are the greatest! Turnbull, Colin M., The Mountain People, Touchstone, New York, 1972. My mother, who was born in 1916, had a “sweet tooth.” When I was born, she had dentures, no teeth. White flour and sugar were common ingredients in many meals I consumed between childhood and into my 40s. She got diabetes, and I did too. My first dentist said I had teeth like a horse. They are crowded and crooked. All four of my wisdom teeth were surgically removed, because they were growing sideways, toward the molar next door. I brushed my teeth, but still got cavities. Back in the sixteenth century, Queen Elizabeth also had a sweet tooth. Sidney Mintz told an amusing story about her meeting with a German gentleman, who was deeply impressed when her smile revealed a mouthful of black teeth. The peasants looked much healthier than the royalty, because they couldn’t afford sugar, which was an expensive luxury in those days. In 1893, Weston Price became a dentist in Cleveland, Ohio. As the years passed, Price became aware of a highly unusual trend — the amount of tooth decay that he observed was growing sharply. Something strange was happening. He was watching a serious health crisis emerge right before his eyes, and he didn’t understand the cause. Price suspected that the problem was related to dietary changes. His curiosity grew. Finally, he decided to do some travelling, in search of healthy people, to see how they lived differently. He spent much of the 1930s visiting many lands, examining the teeth of the residents, taking photographs of them, and studying their diets. He went to remote places where people continued to live in their traditional manner, in regions including Switzerland, Ireland, Africa, Australia, New Zealand, the Arctic, and Peru. He found many people with beautiful perfect teeth, and he found many with serious dental problems, like his patients in Cleveland. Importantly, he discovered a clear difference in the diets of the two groups. 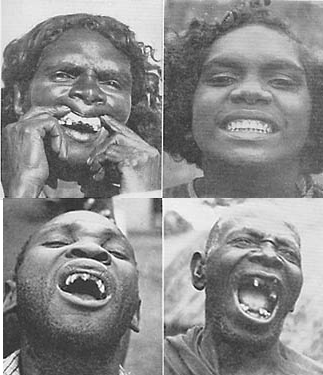 The people with happy teeth ate the traditional diet of their region, never used a toothbrush, and never saw a dentist. The people with crappy teeth ate a “modernized” diet, including white flour, refined sugar, canned vegetables, jams, and marmalades. Those who lived in remote villages in the hills were fine, but those who lived by the shore, and ate imported modern foods, suffered for it. If one brother stayed in the hills, and the other brother moved to the city by the sea, the difference in their dental health was often striking. Among those eating the modernized diet, the incidence of problems varied from place to place. In some locations, only 25 percent of them had problems, but in other locations up to 75 percent were affected. Price finally went home and wrote a book to document his findings. Nutrition and Physical Degeneration was published in 1939. The book is loaded with stunning photos. Readers will never forget the powerful pictures. Most of the book’s contents, including the pictures, are available HERE. Click through the pages. His writing includes some racist language that was common in that era. For the first 200 pages, the chapters proceed, region by region, comparing the health of the people, based on their diet. His descriptions get repetitive, because wherever he goes, he reports the same findings — people who ate their traditional diet had healthy teeth, and people who ate the modern diet more often had lousy teeth and other problems. I did some research to see if white flour and sugar were newer foods for the working class and poor. Yes, they were. By the late nineteenth century, both products had become widely available and inexpensive. The primary reason for this was new technology, steam-powered steel roller mills, which appeared around 1890. Melissa Smith and Steven Gundry wrote about the unintended consequences of roller mills. Previously, grain had been milled between stones, which ground together all parts of the wheat berry, resulting in whole wheat flour. White flour had been made by bolting — sieving whole wheat flour through fine cloth. This was a time-consuming process, so white flour was expensive. White bread was a luxury that only the rich could afford. The waste byproduct of the bolting process was the super-nutritious bran and germ, which was usually fed to livestock. The new roller mills crushed the grain, rather than finely pulverizing it. This made it much easier to separate the bran and germ from the powdered endosperm (white flour). Because of this, white flour could now be cheaply mass produced. Since people perceived white flour to be a desirable luxury food, they eagerly consumed it. Gundry noted that the new process eliminated both the fiber-rich bran, and the germ, which was rich in oil and vitamins. White flour was little more than highly refined carbs, which rapidly enter the bloodstream — empty calories. White flour had a much longer shelf life than whole wheat, because it had no oil which would go rancid over time. White flour could be shipped to the ends of the Earth, and stored indefinitely. By the 1920s, folks realized that white flour was crap. New regulations required that white flour be “enriched” with nutrients, including thiamin, riboflavin, niacin, and iron. Despite enrichment, white flour remains nutritionally inferior to whole wheat. With regard to sugar, the steel roller mill was a big improvement. It could extract up to 85 percent of the juice from the cane. The previous technology could extract only 20 percent. So, each ton of cane could produce much more sugar, which lowered the price, and enabled mass production. Sugar became a major component of the working class diet. By 1900, 20 percent of the calories in the English diet were provided by sugar. Many factory workers started their day with a slice of white bread spread with sugar-packed jam, marmalade, or treacle — many calories, few nutrients. According to U.S. Department of Agriculture statistics, the average annual consumption of caloric sweeteners per person in the U.S. peaked in 1999 at 151.6 pounds (68.7 kg). In 2016, it was down to a mere 128.1 pounds (58 kg). Sugar consumption nearly doubled in the U.S. between 1890 and the early 1920s — an era of rapid growth in the candy and soft drink industries. In some U.S. cities, diabetes deaths quadrupled between 1900 and 1920. By the 1930s, the cancer rates in the U.S. were clearly on the rise. Diabetes and cancer are far less common in societies that do not eat a Western diet. Smith discussed Dr. Thomas Cleave’s “Rule of 20 Years.” The old doctor noted a spooky pattern. In numerous locations, 20 years after the arrival of white flour and white sugar, primitive people started to suffer from heart disease, hypertension, diabetes, gallbladder disease, and colitis. Mintz, Sidney W., Sweetness and Power — The Place of Sugar in Modern History, Penguin Books, New York, 1985. Gundry, Steven R., Dr. Gundry’s Diet Evolution, Crown Publishers, New York, 2008. Smith, Melissa Diane, Going Against the Grain, Contemporary Books, Chicago, 2002. Weston Price Foundation — info on nutrition and health.